So, just what is VoIP all about? VoIP, or Voice over Internet Protocol, is a method for taking analog audio signals, like the kind you hear when you talk on the phone, and turning them into digital data that can be transmitted over the Internet. How is this useful? VoIP can turn a standard Internet connection into a way to place free phone calls. The practical upshot of this is that by using some of the free VoIP software (such as Skype) that is available to make Internet phone calls, you’re bypassing the phone company (and its charges) entirely. VoIP is a revolutionary technology that has the potential to completely rework the world’s phone systems. VoIP providers like engin and iinet have already been around for a while and are growing steadily. ATA — The simplest and most common way is through the use of a device called an ATA (analog terminal (telephone) adaptor). 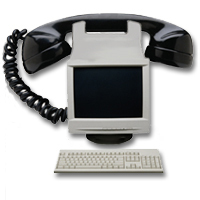 The ATA allows you to connect a standard phone to your computer or your Internet connection for use with VoIP. The ATA is an analog-to-digital converter. It takes the analog signal from your traditional phone and converts it into digital data for transmission over the Internet. IP Phones — These specialized phones look just like normal phones with a handset, cradle and buttons. But instead of having the standard RJ-12 phone connectors, IP phones have an RJ-45 Ethernet connector. IP phones connect directly to your router and have all the hardware and software necessary right onboard to handle the IP call. Computer-to-computer — This is certainly the easiest way to use VoIP. You don’t even have to pay for long-distance calls. There are several companies offering free or very low-cost software that you can use for this type of VoIP. All you need is the software, a microphone, speakers, a sound card and an Internet connection, preferably a fast one like you would get through a cable or ADSL modem. Except for your normal monthly ISP fee, there is usually no charge for computer-to-computer calls, no matter the distance. How does VoIP / Internet Voice work? A broadband (high speed Internet) connection is required. This can be through a cable modem, or high speed services such as ADSL or a local area network. A computer, adaptor, or specialized phone is required. Some VoIP services only work over your computer or a special VoIP phone, while other services allow you to use a traditional phone connected to a VoIP adapter. If you use your computer, you will need some software and an inexpensive microphone. Special VoIP phones plug directly into your broadband connection and operate largely like a traditional telephone. If you use a telephone with a VoIP adapter, you’ll be able to dial just as you always have, and the service provider may also provide a dial tone. If I have a VoIP service, who can I call? Some VoIP services offer features and services that are not available with a traditional phone, or are available but only for an additional fee. You may also be able to avoid paying for both a broadband connection and a traditional telephone line by using a “naked DSL” service. Not all VoIP services connect directly to emergency services through OOO or 911. Can I take my phone adaptor with me when I travel? Some VoIP service providers offer services that can be used wherever a high speed Internet connection available. Using a VoIP service from a new location may impact your ability to connect directly to emergency services through OOO or 911. How do I know if I have a VoIP call?